Highland Guides are able to cater for larger groups on request and are proud to offer the services of 7 highly active and professional Mountaineering Instructors. All our staff, as well as being fully qualified, are highly motivated in their own personal mountaineering be it on UK rock, ice, the Alps or further afield. It’s well worth getting in touch for a conditions report, or checking the news page, because you can bet we will have been climbing somewhere interesting recently! As well as the hard skills and experience described below all the Highland Guides staff are chosen for their friendly and patient approach. Their ability to teach, guide well chosen routes and be generally good companions on the hill will ensure you have a mountaineering experience to remember. Rob has had a long and traditional mountaineering apprenticeship and has visited most of the fantastic venues here in the UK for rock and ice climbing. He's climbed a wide variety of extreme British rock routes from the Hebridean uber-classics 'A Prophecy of Drowning' and 'Voyage of Faith' to the Welsh Mountain and Sea Cliff classics like Great Wall and Right Wall (Cloggy & Dinas Cromlech); Suspense and Trevallen Pillar (Pembroke) and High Pressure and Hunger (Gogarth). A regular on the Scottish winter scene and ascents of hundreds of ice and mixed routes throughout the Highlands including over 50 on Ben Nevis alone. Climbed extensively throughout the French, Swiss and Italian Alps including over 65 Alpine routes such as the North Faces of Les Drus, Droites, Grande Jorasses, Sans Nom, Grande Rocheuse, Midi, Argentiere, Courtes etc. 13 International expeditions (to the Indian and Nepalese Himalaya, Pakistani Karakorum and Hindu Kush, Kyrghyz Tien Shan, Argentine Andes, Moroccan high Atlas, Chinese Pamir, Antarctic Peninsula, Colorado Rockies) on peaks up to 7500m including numerous first ascents, many whilst guiding. Ascents of the well known summits of Ama Dablam and Khan Tengrhi as well as various less technical peaks such as Acconcagua and Mera. Extensive Ski Touring experience throughout the French, Swiss and Italian Alps. 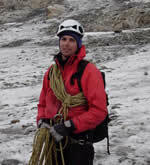 Rob also has a degree in Environmental Science and Ecology and a keen awareness of the mountain evironment. Having spent many seasons working and climbing in the Scottish Highlands Tim is an experienced MIC and is now also registered on the IFMGA Guides scheme. He has a background of hard winter climbing in Scotland, Norway and the Alps with ascents of a diverse set of routes from a solo of Royal Pardon (VI,6) to The North Face of Les Droites to the first ascent of 'Gully of the Cods' (VII,7) with Dave Hunter in Norway's Lofoten Islands. Further first ascents in Antarctica as well as closer to home on UK rock and Scottish Ice. Tim has led various international expeditions to the Nepalese Himalaya, Kyrgyz Tien Shan, Rwenzori Mountains (Uganda) , Ecuador and Kilimanjaro. Involved in the committee work of the Association of Mountaineering Instructors Tim is a well known and popular figure on the UK instructing and guiding scene. 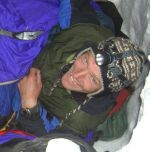 Nick has an impressively varied climbing CV spread over 20 years in the mountains. He is a popular associate instructor at Plas-y-Brenin and has ticked a number of Welsh rock classics up to E4 particularly on the slate. Much Scottish winter mountaineering and hard mixed climbing experience including a recent and rare repeat of the fickle Fiddlers Nose in the far North West Highlands. Difficult first ascents in Peru and Nepal including the cold and committing ‘Edge of Darkness’ NW face of Tengkang Poche with Nick Bullock in October 2004. Led numerous international expeditions to the Nepalese Himalaya, Kyrgyz Tien Shan, Acconcagua and Kilimanjaro. Mike is an experienced MIC and regular on the Scottish winter guiding and instructing scene having worked for both Glenmore Lodge and Outward Bound Scotland. He’s pretty handy with the tools and has a wide range of winter climbing experience from difficult Scottish mixed routes like the Fiddlers Nose (the ‘Walker Spur of the Highlands’), alpine winter routes and Polar Circus – The world class Canadian ice route. Regular alpine activist with a recent ascent of the Walker Spur, Grandes Jorasses North Face, under his belt. Led on expeditions to the Kyrgyz Tien Shan. Mike's unassuming and patient approach has proved popular with Highland Guides clients who have found days on the hill with him to be a fine combination of instruction, climbing and good craic! James is based in the Peak district and is a highly respected member of the Edale Mountain Rescue Team. He combines the twin roles of being a senior instructor at an outdoor centre and a self employed MIC. Despite this he finds time to get onto the rock and has an impressive ‘hard grit’ ticklist including a rare onsight of the scary ‘Science Friction’ (E6 6a) and a cool headpoint of the protectionless Dawes testpiece ‘Benign Lives’ (E7 6c). Like the rest of us James migrates north for the winter and is a familiar face on Ben Nevis and the North West. Recent ascent of the superb Central Buttress on Beinn Eighe to his credit as well as the Nevis classics, Minus One Gully and Astral Highway. Jim has an impressive dedication to 'easy jet alpinism' and this commitment has payed off recently with numerous successful trips in all seasons producing ascents of the North Faces of The Eiger, Sans Nom, Badile, Cengalo, Drus and Cima Grande. First Ascent of ‘Steeple’ in Greenland’s Lemon Mountains, TD. Andy is an experienced MIC with a hard winter climbing background. Well known on the Scottish mixed climbing scene for a tough no-nonsense approach he has an impressive CV of first ascents and hard repeats to his credit - The first winter ascent of Sioux Wall, VIII,8, Ben Nevis; FWA Rumplestiltskin VII,8, Cairngorms and repeats of the hard classics like Unicorn VIII,8, Cornucopia VII,9, Neanderthal, The Vicar, the list goes on!.....Stop press Decmber 2007: Andy is now even more well known thanks to his outstanding on-sight of the hardest winter route in the UK led in this style - 'The Secret', X,10, Ben Nevis. Originally from Stockport, Andy has had a long and traditional mountaineering apprenticeship which has taken him from the craglets of Windgather to the massive granite big walls of Patagonia and Yosemite. He is in a small select club of climbers who have topped out on Cerro Torre in Patagonia, one of the worlds more difficult summits and has tried the massive and imposing North Face of Machermo in the Nepalese Himalaya. An audacious series of hard alpine routes like a one day ascent of the American Direct on Les Drus, the North Face of the Matterhorn and the North Face of the Grande Charmoz, Chamonix. Despite all this hard climbing Andy is a patient and good humoured instructor sure to enhance and inform your time in the mountains. • Silvia has been climbing all over the world for 22 years. 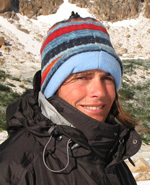 Originally from Argentina, she has been resident in the UK for the last 18 years and is a physical education and modern languages teacher with extensive experience in coaching rock climbing. • In the UK her trad achievements include many classic E5s such as Right Wall, Positron and Alien in North Wales; Black Magic and Darkinbad in North Devon; A Grey English Morning and Headhunter in Pembroke. In 2006 she pulled off her hardest lead on natural gear by doing Mammoth Direct (E6) on the Main Cliff of Gogarth. • Silvia was the British Indoor Climbing Champion in 1994 and a member of the British Competition Climbing Team from 1993 to 1995. • In sport climbing, she has climbed over twenty routes graded 8a and above in locations throughout Europe, UK, Asia and Australia. She has recently red pointed her hardest sport route: El Oraculo (8b) in El Chorro, Spain. In the autumn, Silvia migrates to Southern Spain, where she offers rock climbing instruction and guiding in sunny venues.